Happy 2015 folks! I hope ya’ll have a good one. I can think of no better way of getting a new year off to a great start by ending the previous year with an adventure in Roatán, Honduras. Roatán (aka The Big Island) is the largest of Honduras’ Bay Islands which lie off of the coast of the mainland. It is well-known for its flora, fauna, and friendliness. It is beautiful, with long white sand beaches and tropical plants galore. It also has an interesting history as being the safe harbour for the Dutch, English, and French pirates (or buccaneers) that raided cargo ships on their way to Spain during the European colonial period. Included among them? Henry Morgan and John Coxen. In fact, pirate caves can still be found on the eastern end of the island. While the scenery and history were very intriguing, my main focus was the fauna and friendliness nexus. Yes, this was another intercultural/interspecies communication experience. However, it is VERY different from the one in Malaysia that I discussed previously. 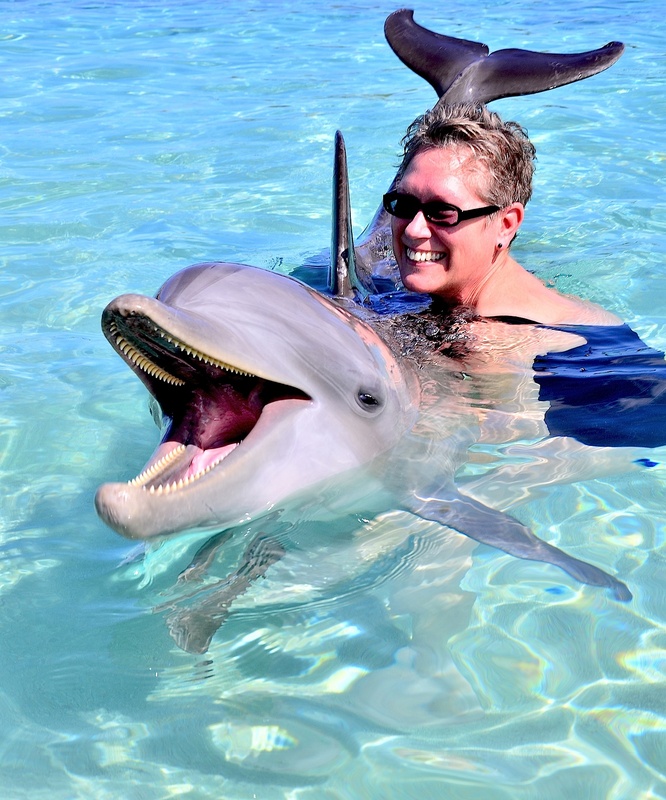 You see, on Roatán you can interact with a dolphin. I have been fascinated by these wonderful creatures since seeing them for the first time in various parts of Southeast Asia in the 1990’s. I have also observed them in Alaska, Britain, Canada, Norway, Peru, and believe it or not, the ferry voyage from Galveston to the Bolivar Peninsula here in Texas! Additionally, I have read about them in German novelist Frank Schätzing’s book Der Schwarm (The Swarm). Obviously, I had to check it out…and am I ever glad I did. Anthony’s Key Resort houses the Roatán Institute for Marine Sciences. Here, you have a number of different opportunities to engage with dolphins in their natural habitat. You can interact with them on Beach Encounters, Action Swims, Snorkel and Swims, Dives, Specialty Courses, or Trainer for a Day Experiences. I selected the Beach Encounter which includes a big kiss. Once in the water with our human group of 6-8, we were introduced to our dolphin. Our group was met by a 2-year old named Champ. We had been told that he would act like a typical 2-year old: boisterous and energetic…which he was. The experience was awesome! His skin felt like soft leather. His eyes were gorgeous. He had an unbelievable smile. He weighed 700 pounds…and…was pure muscle. How do I know he was pure muscle? I got to hold him. Seriously. Try to cradle a 700-pound toddler and you will clearly know the muscular power of these creatures. He was also intelligent and funny. He showed us his swimming prowess and ability to jump. He thoroughly enjoyed our clapping and laughter. He communicated with us with clicks and whistles. Just so you know, these are not dolphins that are continually contained in a lagoon. They are allowed to leave their compound and roam the Roatán reefs until they want to return. They are happy campers. This type of experience has been on my “bucket list” for years. It was a one-of-a kind intercultural/interspecies encounter that I will never forget. 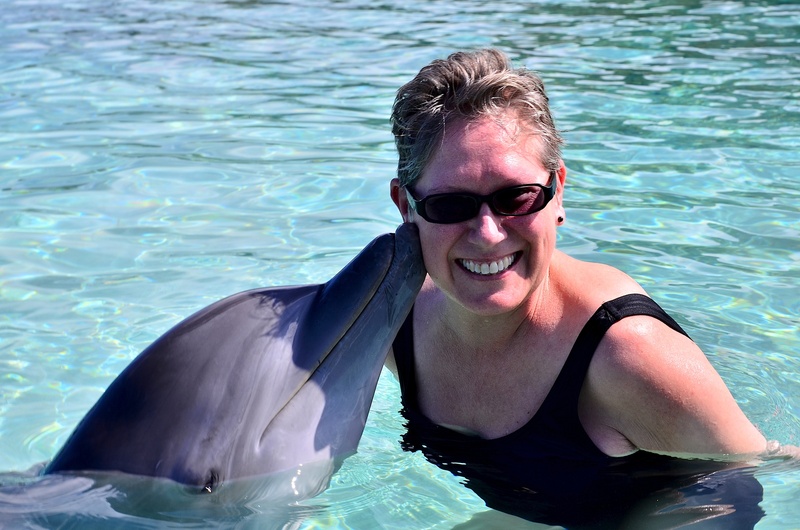 All I can say is: getting up close and personal with a dolphin = priceless. I love this article! It sounds fun & makes me want to try this some day! Thanks Javier. I think you would enjoy it!